The volume of sea ice in the Arctic has likely hit its lowest level since satellite measurements began in 1979, report researchers at the University of Colorado at Boulder’s National Snow and Ice Data Center, who confirmed that Arctic sea ice extent was the second-lowest on record this year. Average sea ice extent during September was 1.8 million square miles, just 9 percent above last year’s record low of 1.65 million square miles and 34 percent below the long-term average from 1979 to 2000. 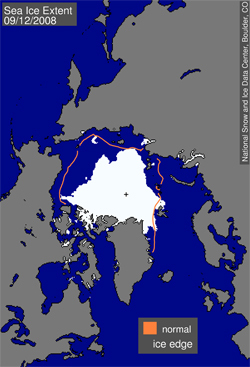 The researchers say the 2008 low “strongly reinforces the 30-year downward trend in Arctic sea ice extent”. The researchers say cool spring conditions, cloudier skies, and wind patterns help avoid a new record low this year.